On any given night at least 3000 people will suffer from homelessness, that adds up to 30,000 people each year in Baltimore. 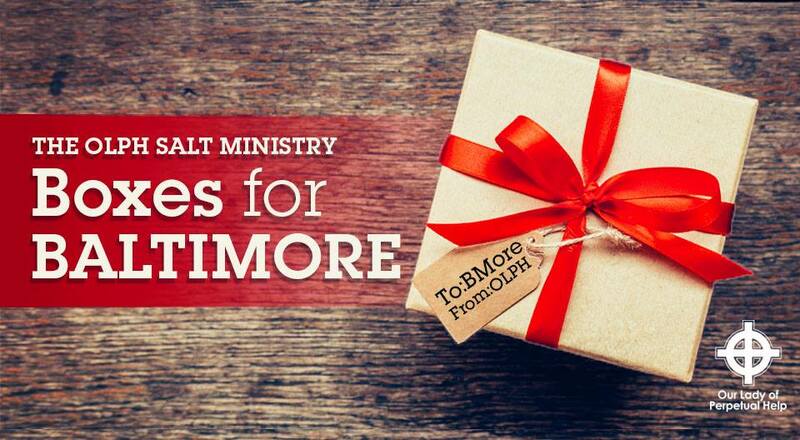 Join us for a Christmas Project sponsored by OLPH-SALT to provide 600 care packages to those we serve in Baltimore City. Please visit https://goo.gl/RoCevW to donate anything from an empty shoe box, to note of encouragement, to prayer or gift cards. Donations can be accepted after weekend Masses on Dec 1st & 2nd in the OLPH Good Shepherd Room. Our goal is to ensure every person that we serve receives the love of Christ and a gift on Christmas. 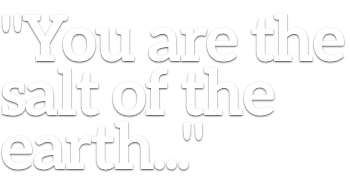 Jesus calls us to be "the salt of the earth". Just as salt is a necessary part of life, preserving and enhancing food, so the Christian is called to be a necessary part of the world, sprinkled out into everyday life to preserve and enhance the lives of others and build up the Kingdom of God. SALT is a hands-on parish ministry that puts Jesus' words into action by serving the hungry and needy of Baltimore City and Howard County in a direct, relational way by preparing meals and serving the hungry. Friday Night Meal Ministry at St. Vincent de Paul in Baltimore City. A team of parishioners prepares food at OLPH in the Parish Center kitchen and then delivers and serves the food to the hungry and homeless at St. Vincent de Paul Church, located at the corner of E. Fayette and the Jones Falls Expressway. On the Fifth Friday of the month, OLPH provides the entire meal which is served at St. Vincent de Paul Church. Click here to sign up to help on a Fifth Friday. Before heading downtown see "What do I do to go offsite" below. Every Saturday and Sunday mornings, members of the SALT team meet at OLPH and brew fresh hot coffee and prepare a simple hot breakfast. They pack it up and then head downtown where they set up tables outdoors, near Our Daily Bread and on S. Broadway where they serve whomever is hungry. You can serve either in the kitchen at OLPH or on the street as a group of Parish missionaries who provide just a little "All Weather Compassion" every Saturday and Sunday morning. Before heading downtown see "What do I do to go offsite" below. It's as easy as signing-up online and making sure you what time to meet the team here at OLPH. Here is more information on each of the ways we serve and how you can get involved! Every Friday night SALT team members serve at St. Vincent de Paul Church in Baltimore City. Every 1st-4th Friday we cook, deliver and serve baked chicken legs, desserts and other dishes. And on every 5th Friday we provide the entire meal. It takes a big team but there are lots of helpful, easy ways to serve. Sign up here to serve on Friday Nights! Sign up here to be a part of our 5th Friday effort! Before heading downtown see "What do I do to go offsite" below. Every Saturday and Sunday mornings, members of the SALT team meet at OLPH and brew fresh hot coffee and prepare a simple hot breakfast. They pack it up and then head downtown where they set up tables outdoors, near Our Daily Bread and on S. Broadway where they serve whomever is hungry. You can serve either in the kitchen at OLPH or on the street as a group of Parish missionaries who provide just a little "All Weather Compassion" every Saturday and Sunday morning. Sign up here to serve on Saturday or Sunday Mornings! We need gently used clothing for our homeless friends so we can help them live a life with dignity and modest comfort. Most often our requests are for socks, jackets and boots. Clean out your closets or pick up clearance items - it will all be put to good use. If you have some clothing that you'd like to donate, please email SaltAtOlph@gmail.com. If you prefer, you can always pick up any of the following items while you are out shopping. Simply mark them SALT and drop them off at the kitchen in the receptacle marked SALT or whenever it is open. We collect toiletries (shampoo, soap, lotion etc) to be distributed to the homeless. Please mark the bag with SALT and put it in the church pantry on the floor whenever you have items to give. We particularly like travel sized products but can use any size you are willing to donate. Money is, as you would expect, important to all of missions at OLPH. We’ve made it easy for individuals both inside the parish as well as outside to make “one time” donations via credit card by clicking here. If you want to do a recurring credit card donation you will log into myOLPH here, select "Repeating Gift" and "SALT donations". If you would like to donate via a personal check, you can drop it into the weekly offering or mail it to Lisa Sliker at the Parish Office. Please be sure to mark it for SALT in the memo line and make the check out to OLPH. If you want to donate cash you can put it into a envelope and mark it for SALT and either put it in the weekly offering or drop it by the Parish Office for Lisa Sliker. Of course, you can donate money to the poor box in the church and a portion will go to support SALT. What do I do to go offsite? Going to other locations besides working at OLPH and your home requires a few steps. 1. Adults will need to fill out a waiver. Click here for the form or you use the forms that we have in the notebook in the kitchen pantry. You only need to do this one time and put it in the plastic protector in the notebook. 2. If you are are bringing a child, you need to fill out a waiver for your child(ren). Click here for the form or you can use the forms that we have in the notebook in the kitchen pantry. Please note that if you are bringing children there will be one site designated for children to ensure people are Shield certified in the children's group. Also please remember that children cannot be dropped off without their parent or other authorized adult accompanying them.